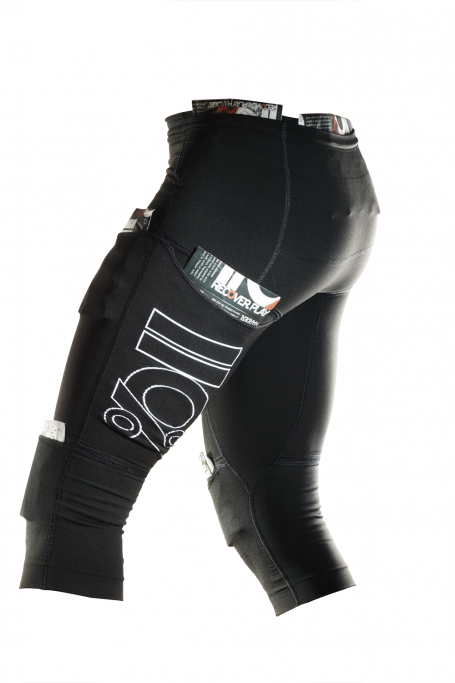 110%’s Juggler Knicker’s seek to provide athletes with simultaneous compression and ice. Workout recovery is a big deal. A football season can take a brutal toll on the body. Especially during the two-a-days of fall camp under the strain of the hot August sun. When I played, following a grueling practice, there was always a mad rush by the offensive and defensive lineman to the large water troughs that lined the edges of our practice fields. Filled with ice and water, these havens served to give us what we believed were the many benefits of the ice bath. While there is some conflict in whether or not the ice bath is helpful or not, many believe that ice baths are beneficial in terms of recovery. Additionally, we are all very aware of the RICE protocol. Rest, Ice, Compression, and Elevation. Have an injury, whether it be joint or soft tissue; the prescription, at least early in the recovery process, is to RICE it. To assist athletes with workout recovery, we now have access to 110%’s product line. 110%’s compression products have integrated ice packs throughout that provide the wearer with simultaneous compression and ice to help athletes with recovery. This help doesn’t come cheap as the kneel length product goes for $150 and the full length pair are $250. Price not withstanding, reviews are pretty good with comments like, “I feel like my recovery doubles and I’m not as sore,” and “I couldn’t imagine training without them.” While anecdotal, these reviews seem to show that many people are happy with their experiences. The following video is from the 110% website and provides a good visual of what the product is all about. While the science behind ice baths is at least debatable in its ability to help recovery, as a player I always felt better during the practices after utilizing the ice baths. Perhaps it is a placebo effect. As for the compression aspects of the product, I don’t have any personal experience to draw on, and the science is once again unclear, or at least limited in its reliability. What are your experiences with ice baths and compression clothing? Do you believe either work? Do you use ice baths in your practices or compression products for your workouts? Sound off in the comments below!